Baseball may be the American pastime but food comes in at a close second. 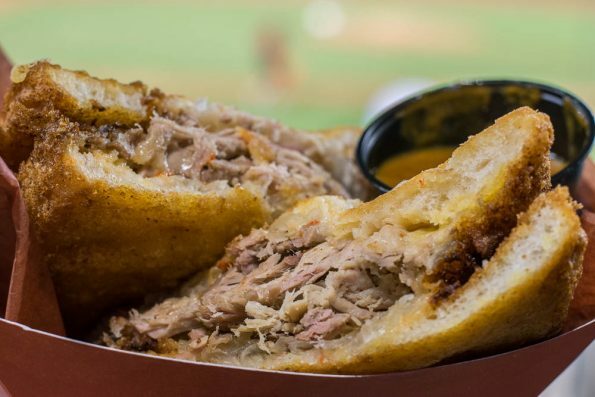 Baseball stadiums across the country try to impress attendees by serving extreme food. Most of the time this food is gimmicky and doesn’t have much flavor other than fried. The Dbacks and Chase Field do not have this problem! In fact, they strive for and succeed at serving up the wow factor! We are always excited to try extreme food and our visit to Chase Field was no exception. We had a game plan set and knew exactly what we wanted to try! We were going after the beastly Pit Viper Sandwich, the gluttonous Chile Verde Mac and Cheese Hot Dog, and the spicy Crispy Buffalo Chicken Fries! We also tried a few other things that will be in a separate blog in a few weeks (be sure to check back). It was a challenge to eat the amount we did (they definitely do not skimp on portion size) but we managed. After all, it was research right? We started with the massive Pit Viper Sandwich. This thing is a beast! It must weigh a pound easily! We were shocked at just how heavy it was! The sandwich is made of: pit-smoked pork, caramelized onions and Yancey’s Fancy Peppadew Cheddar cheese on thick-cut bread, battered and fried until golden with house made Snake Bite BBQ sauce. The flavors in this sandwich are fantastic! The Snake Bite BBQ sauce is spicy and smoky and at the time it made me wish I had fries to dip in it! Literally, this sandwich is the manly version of the Monte Cristo. No powdered sugar here! 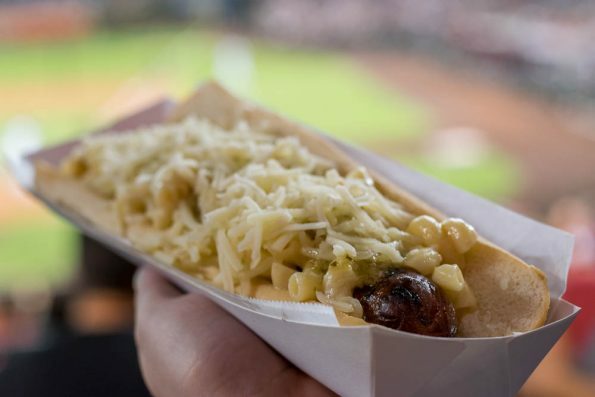 After a brief break (we did actually watch the game), we decided to tackle the Chile Verde Mac and Cheese Hot Dog. Another gigantic option, this hot dog is topped with green chile mac and pepper jack cheese. What we really enjoyed about it, was that instead of just being mac and cheese with a few green chiles thrown into it, it had a distinct verde salsa flavor. Be warned though, this hot dog definitely needs to be eaten with a fork and knife due to the copious amounts of mac and cheese and the size of the hot dog! Last but certainly not least, we tried the Crispy Buffalo Chicken Fries. We were so stuffed at this point but knew we must persevere! 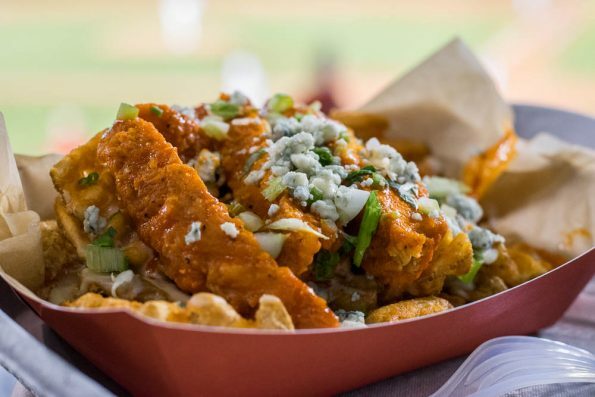 These glorious waffle fries are loaded with Chihuahua cheese sauce, crispy Buffalo chicken, blue cheese and celery. The Buffalo sauce actually had a surprising kick which we really appreciated and we loved that they piled on the blue cheese! We were not left bemoaning the lack of cheese! We had a blast eating our way around Chase Field! In the next few weeks we will be doing a feature on some of the vegan options at Chase Field! So stay tuned! In the meantime, what are your favorite things to eat at Chase Field? We’d love to know! Leave a comment below or use the hash tag #GeekEats.